The most common questions we receive relate to what to expect. Nepal is a developing country. Depending on where you live, or where you’ve traveled before, you may experience a culture shock. We love the quirkiness of Nepal, but it can take a little bit of getting used to. The best way to have the best time in Nepal, is quite simply to ‘not expect’ anything. If you don’t have any expectations, then you won’t be disappointed! Instead you can marvel at the different way of life. Notice and feel grateful for the things many of us take for granted every day of our lives. That said, there are things we can help you prepare for. We share some of them in our FAQ’s and we’ll keep adding to this blog too! Is 'getting fit' on your resolution list for the New Year? Give yourself a great incentive. Get fit to trek Nepal! Home to eight of the ten highest mountains in the world - you don't need any more reasons to visit this incredible country! Yet there are more, many more and it still costs less than most adventure holiday destinations. But to see the amazing 'on top of the world' views, you need to be in shape. Trekking Nepal is challenging. Yet if you do it, it will be one of your top lifetime achievements! Trekking Nepal Will Likely Change Your Habits and Could Change Your Life! When I first trekked in Nepal, I didn't know what to expect. Would I be fit enough or would I hold the group back? I pushed my limits beyond what I thought possible and I loved it! I realised then what I was truly capable of physically and mentally. It wasn't long before I went on to do many other longer and more challenging treks in Nepal. But that's not all. I changed my lifestyle at home and started doing a lot more outdoor activity and exercise. I've never been happier or fitter! So, if you want to make some positive changes in your life, getting fit to trek Nepal is a great start! When you push your physical boundaries and succeed, you'll discover a new passion for outdoor adventure! Many people say that trekking Nepal is life changing. Is 2019 your year? Yes, You Can Get Fit to Trek Nepal! Visiting Nepal and trekking in the Himalaya is something many people dream of. But whilst it's a popular 'bucket list' item, there's a common perception that it's just too hard for a lot of people. Well, have we got news for you! Is ‘getting fit’ on your resolution list for the New Year? Give yourself a great incentive. Get fit to trek Nepal! Home to eight of the ten highest mountains in the world – you don’t need any more reasons to visit this incredible country! Yet there are more, many more and it still costs less than most adventure holiday destinations. In this short Nepalorama client interview, we asked Ellie and Jan from the UK what they thought about their trek in Nepal. 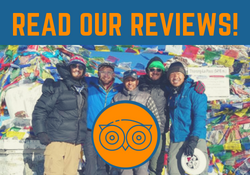 They trekked with our founder Krishna in the Langtang Valley in September 2018. They didn’t quite make it all the way to the holy lakes of Gosaikunda due to heavy rain – but it didn’t dampen their spirits! What’s it Really Like Trekking Nepal? – A Day in the Life!